It’s time to start planning your visit to the 2016 Epcot International Food and Wine Festival and our friends at the Disney Food Blog have published the only planning tool you need – the DFB Guide to the 2016 Epcot Food and Wine Festival ebook! This fully-updated, full color ebook features more than 250 pages of information, photos, and more to help you plan your time at the Epcot Food and Wine Festival. The 2016 Epcot Food and Wine Festival runs for a record 62 days this year from September 14 through November 14! In the ebook you’ll find: a detailed daily schedule of events for EVERY DAY of the Festival; a printable World Showcase booth menu checklist; themed World Showcase booth crawls; touring strategies; a chapter dedicated to “what’s new in 2016;” full indexes for food, wine, wineries, beer, cocktails, and chefs; and much more! 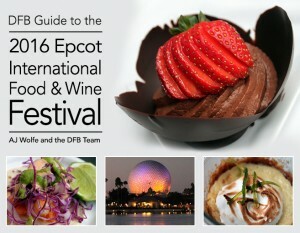 To celebrate the grand launch of the DFB Guide to the 2016 Epcot Food and Wine Festival you can get the Guide for 20 percent off the cover price of $14.95 with the code Chefs16. For the most up-to-date information on the 2016 Epcot Food and Wine Festival make sure you bookmark the Disney Food Blog’s 2016 Epcot Food and Wine Festival page. This entry was posted on Thursday, July 21st, 2016 at 3:00 pm	and is filed under Dining, How To, Planning, Theme Parks, Tickets, Touring Plans. You can follow any responses to this entry through the RSS 2.0 feed. You can leave a response, or trackback from your own site.